ABC News reports this morning – Secretary of State John Kerry did what for many of Israel’s supporters is the unthinkable and used the A-word: apartheid. Apparently for many Jewish groups, the suggestion that the Jews only State is, or even could be, an ‘Apartheid State’ is unthinkable. But far more interesting is the fact that the Jewish Lobby in America believes that it can dictate to the Secretary of State what terms to use and what words to avoid. “Any suggestion that Israel is, or is at risk of becoming, an apartheid state is offensive and inappropriate,” AIPAC’s statement read in part. And it didn’t take long for American Shabbos Goyim within the Congress and Senate to weigh in. House Majority Leader Eric Cantor, R-Va., released a statement urging Kerry to apologize to the Israeli government and people. Sen. Ted Cruz, R-Texas, suggested Kerry shouldn’t even have the chance to apologize, as he took to the Senate floor to call for the secretary to step down. But in truth, Kerry is actually slightly wrong – Israel is not an Apartheid State. It has never been so and never will be. Apartheid is a racially driven system of exploitation. But Israel doesn’t want to exploit the Palestinians, it wants them gone! Israel is racist, nationalist and an ethnic cleanser. The Jewish State is not an Apartheid state, instead it follows the Nazi model of ethnic purity. That realisation can really upset the progressive Jews. In fact, the notion of Apartheid in Israel was introduced by the Jewish left in order to divert attention from the fact that Israeli totalitarianism and Nazi-like inclinations deeply embedded within Zionist thought and Jewish political thinking. Shockingly, the terminological strategy that is used by the Right wing lobby AIPAC against Kerry is also implemented daily by the so-called Left and ‘progressive’ Jewish Lobby that seeks to dominate the Palestinian solidarity discourse. Max Blumenthal , previously a dedicated ‘Naz’i hunter and currently an anti Zionist enthusiast, believes that he knows the elementary kosher criterion necessary to save the Palestinians as well as the correct terminology for their struggle. Similarly, the pro-Palestinian blog , Mondweiss, changed its comment policy recently, on their website they wrote: “From here on out, the Mondoweiss comment section will no longer serve as a forum to pillory Jewish culture and religion as the driving factors in Israeli and US policy.” Both Blumenthal and Mondoweiss seek to dominate the terminology of the relevant discourse. But why? What are they afraid of? It is time to admit that dominating the language and dictating a political jargon without regard for ethical considerations or even the truth is a contemporary Jewish political strategy. 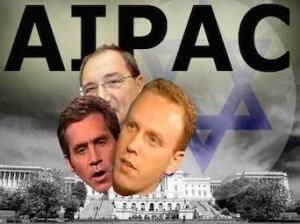 As we can see, AIPAC, Blumenthal, Mondweiss and others follow a similar strategy. They insist upon imposing the notion of ‘correctness.’ But their efforts are actually counterproductive . By trying to control speech. they help the rest of us to identify the Jewish political dynamic of concealment. Jews on the left as well as the right are fearful of any essential discussion of Jewish racism and the reason is obvious. Every form of Jewish politics is racially oriented to a certain extent. Though Jews do not form a racial continuum, Jewishness is a racially driven concept. As much as Israel is a Jews only State, the progressive Jews Voice For Peace (JVP) is pretty much a Jews only political cell. But as the Jewish Left has been desperate to divert the attention from the Jewishness of the Jewish State, and much as Blumenthal, Mondoweiss and others attempt to stop us from looking into the meaning of the ‘J word’, PM Netanyahu and his government are actually increasingly open about the Jewish orientation of their state. They are now demanding that Abbas and the Palestinians accept that Israel is The Jewish State. We may be able to conclude that though political Jews, are desperate to dominate the terminology that shapes the political discourse, they somehow fail to agree amongst themselves what this terminology is.